Villa with large terrace with built-in barbecue, outdoor table with chairs and armchairs, 2 bathrooms, sunshade and small serving table. In interior, living room stay with chimney, kitchen, a room parents, a space room children with bunk beds, a bathroom with shower, a cabinet basin, a toilet independent, various cupboards and a closed courtyard in the extension of the room parents . The villa is located in a quiet, dead end, including a small shopping center, a sports center that includes, among others, an indoor pool and tennis courts nearby. We also have a private pool area, shared with 40 villas. accessible with a punch card available in the house. NERJA - ANDALUSIA: charming typical Andalusian town by the sea. Nerja is named this year as the most beautiful coastal village in Spain and is cited as one of the top 10 destinations for holidays in 2018. Discover the famous balcony of Europe and caves, third most visited Spanish site. Stroll through the beautiful streets of the city center by the sea, take the time to enjoy a paella on the beach. Discover Granada and its famous Alhambra garden, but also the city and its neighborhoods. The region of Alpujarras including the last Moorish villages, Pampaneira, Capiliera, Trévélez and its famous 'jamon'. The cities of Ronda, Mijas, Marbella, Toremolinos Seville, Competa. 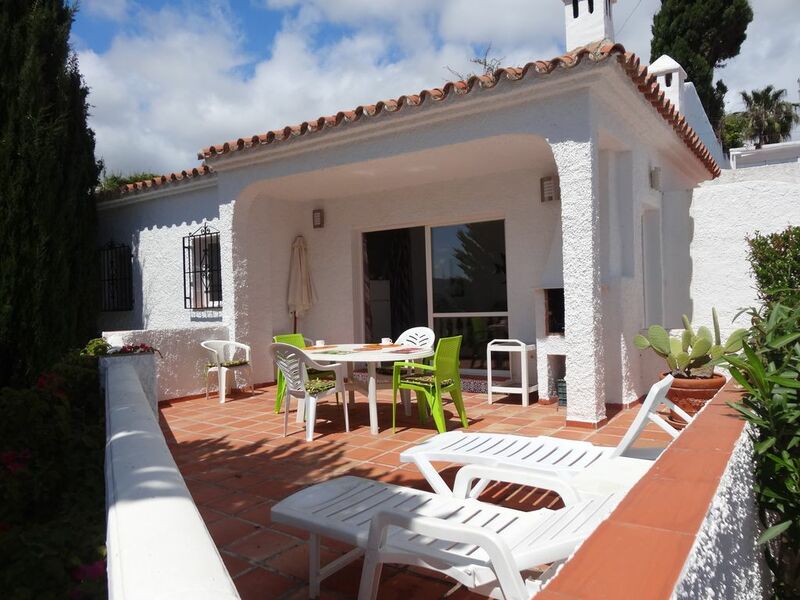 Do not miss out on the small village of Frigiliana, clinging to the mountain at 330m above sea level which is considered to be the best preserved of the Arab era in the province of Malaga just 7 km from Nerja. Discover "el Torcal" of Antéquéra and its particular landscape. You can spend a day in the desert Tabernas and plunge into the scenery of westerns of Sergio Leone, Laurence of Arabia and many other films made in this region. Córdoba and its famous mosque cathedral. Do not miss the so festive atmosphere of the Andalusian evenings, performances by Flamenco and Sevillanas dancing.